On Monday, May 24, 2010 I hesitantly climbed the dark stairs of the Heorot to the 2nd floor, a shy and awkward recent graduate of Ball State, stepping way out of my comfort zone. I sat quietly in the corner, taking in the group of women seated around me. 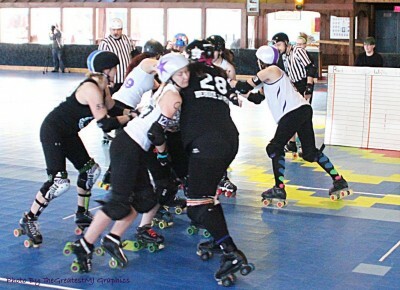 From all walks of life, they too had gathered that day to discuss one thing: roller derby. 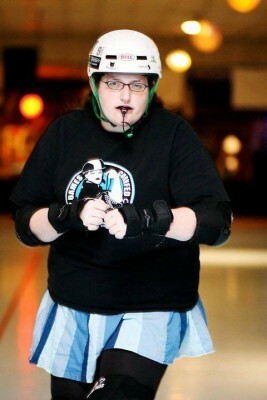 My entire roller derby knowledge consisted of what I was able to glean the night before from a google search. 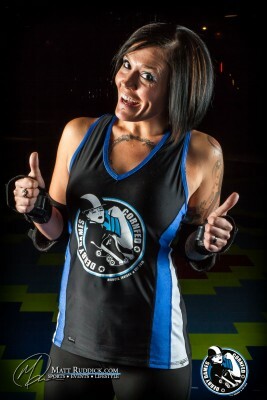 I had seen a flier up at a bar a few days before, explaining that a Muncie roller derby team was forming and that no experience was required. I hadn’t skated in years, yet the idea was intriguing to me. I knew I needed to join something now that I had graduated, lest I become a hermit. Most of my friends had moved out of town and my shyness made it nearly impossible to make friends as an adult. I have no idea what made me brave enough to walk up those dark steps that day, but I’m forever grateful I did. 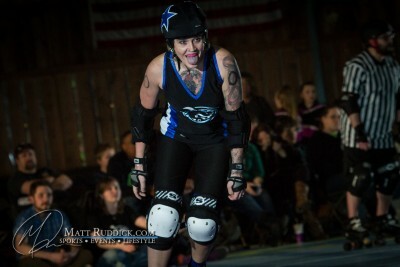 Joining roller derby has, hands down, been the best thing I’ve ever done for myself. It hasn’t been an easy road. I was not a natural skater by any means. 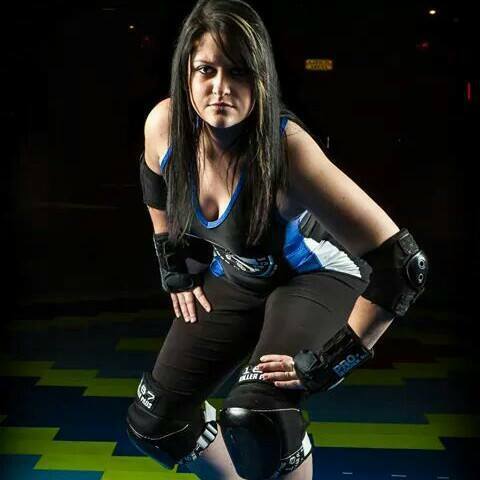 I envied my teammates who seemed to have been born with skates on, and I silently struggled with the simplest moves. Merely staying on my feet was a challenge at first and often my fear and anxiety made my heart pound in my throat. Not being able to contribute to the team with my nonexistent skating skills, I tried to contribute in other ways. 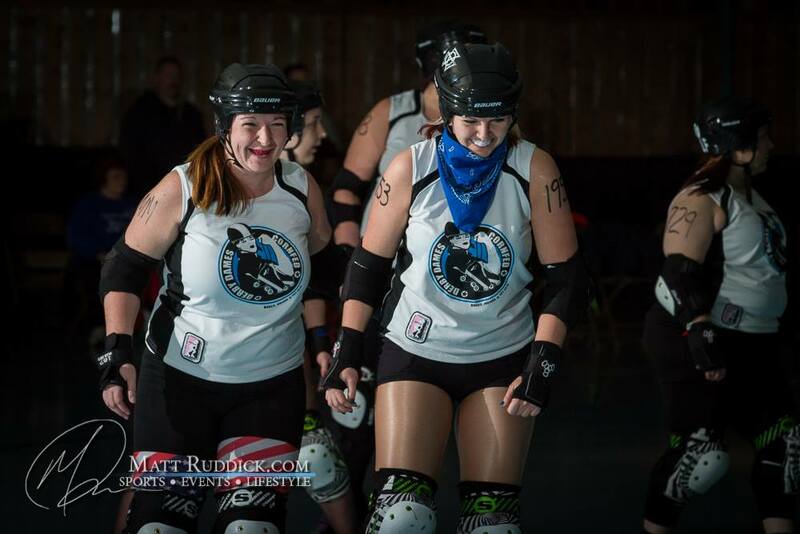 From the beginning I went to every single event I possibly could, promoting the team, spreading the word about derby and volunteering in the community with my teammates. Always an obsessive photographer, I started photographing the team when I could. This was not only a way to contribute, but it also was a bit of a security blanket for me. I was painfully shy, so I could hide behind my camera and still feel useful. I joined almost every committee on the team and worked to help keep our fledgling team going. Slowly (very slowly), I improved. Even more slowly I began to become more comfortable around my teammates. The quiet one for years, I finally began to open up. These women, this amazingly diverse group of strong, independent, funny and caring women never once made me feel stupid for always being the slowest. They always encouraged me, even when I failed. In turn, I grew more confident, less fearful, and pushed my body past what I thought I could accomplish. It took me three and a half years to finally pass all the minimum skills. In January 2014 I passed the dreaded 27/5 (27 laps in 5 minutes), with my team cheering me on the whole time. It would take me two more years of hard work, determination, drills and scrimmages (a year and a half of which I was an alternate and a season of struggling with a knee injury) but finally I’ve earned my first non-alternate roster spot at a CFDD bout. Not only will I gear up on Sunday, February 28th at 4pm as a fully rostered skater, but for the first time ever, we’ll be playing a doubleheader at home. I’m so honored to have the opportunity to play in the first ever Cornfed B team game. The fact that we now have a B team is amazing! We’ve always been a small team and have, at times, struggled with numbers. But our ranks have swelled, giving each and every skater so much more opportunity to learn and grow. As one of the few remaining original members of the team, one who was there before we had a practice space, (when we had no idea what we were doing, but worked incredibly hard anyway) the swell in numbers fills my heart with such joy. 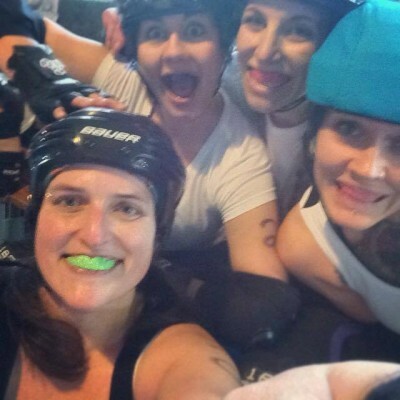 It’s incredible, as someone who struggled for years to do the simplest things on skates, to help the next generation of Dames discover the love of this amazing sport. These women have become so much more than teammates and friends. They’re my family now. And in this supportive and welcoming environment, one that is accepting of all body types, all sexual orientations and all backgrounds, I have found the confidence to finally break out of my shell and the freedom to be myself. It’s been a long journey from that spring day in 2010 to now. One that I’m grateful for every day. There’s been a lot of sweat, tears, tweaked muscles, one unfortunate broken tailbone and bruises beyond count, but I wouldn’t trade it for anything. 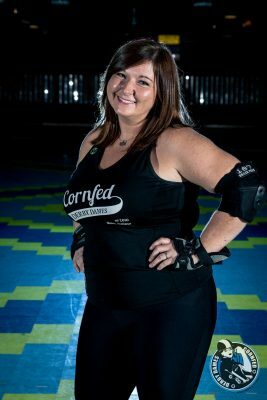 I’m proud to be a Dame, honored beyond words to be rostered at the first home bout of 2016, and excited to see what season 6 will bring. 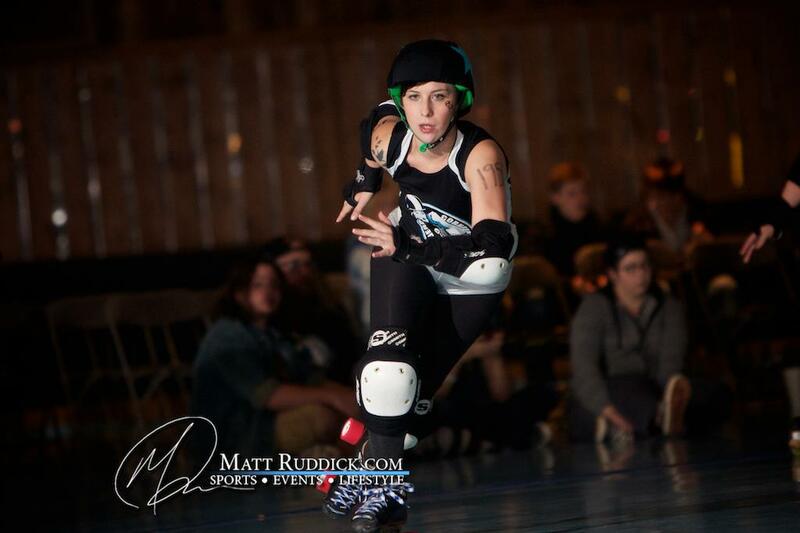 This week’s Featured Skater is fOWL Play #H00T! A new addition to CFDD this season, but no stranger to roller derby, fOWL Play brings new life to the jammer rotation. Hard-working, passionate, and positive are just a few words you might use to describe this truly valuable teammate. 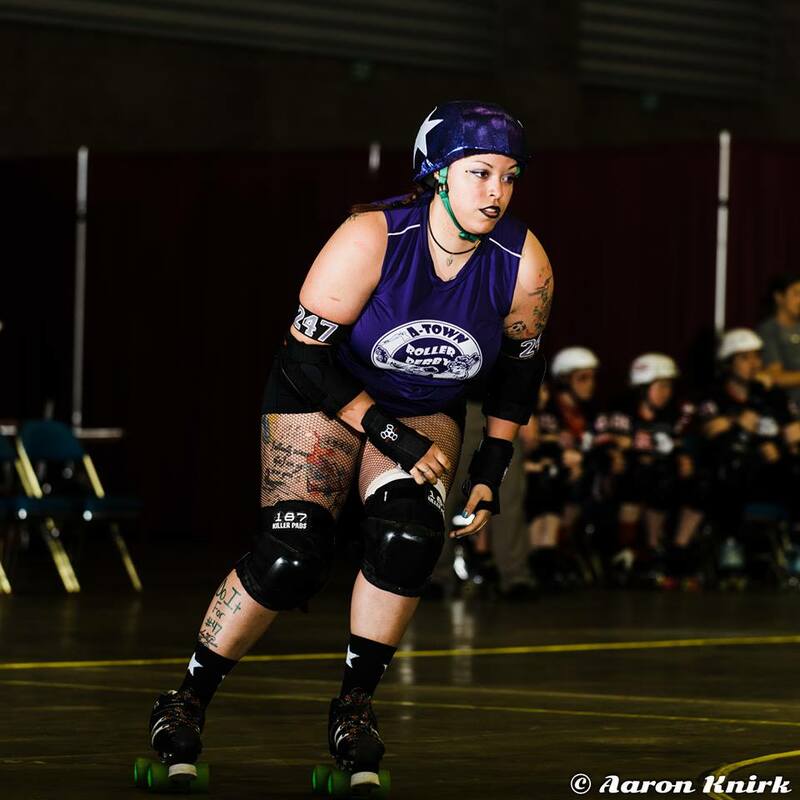 While a majority of her hard work on the track is dedicated to her jammer skills, she also aspires to be a better blocker. fOWL is always on the move outside in warmer months, mostly hiking. Admittedly, her winter workout involves a lot of lifting… the spoon full of chocolate ice cream to her mouth. When fOWL isn’t racking up the points on the track, this proud mom is hanging with her little man, working in accounting, camping, fishing, and enjoying the great outdoors. On bout day, she settles her nerves with the soothing sounds of the 90s! 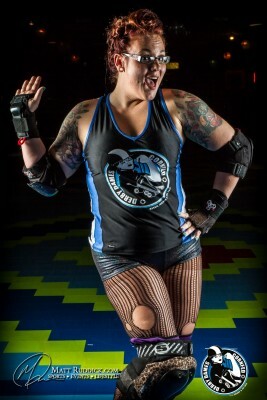 Come see fOWL (and her mustache-tattooed index finger!) 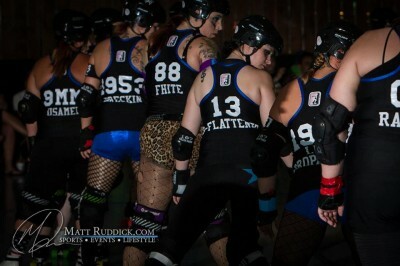 and the rest of the Dames on Sunday, March 29th as we take on the Circle City Socialites from Indianapolis! Tickets are available through Brown Paper Tickets, at the door, or any Dame. 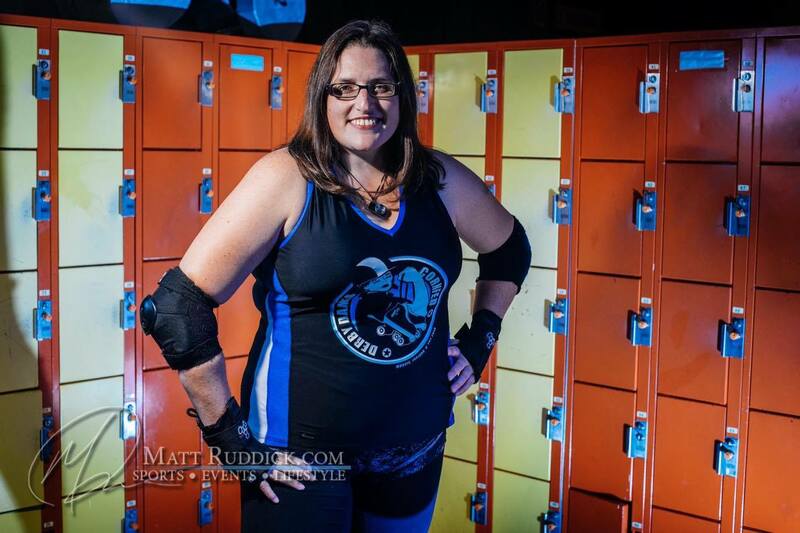 This week’s featured skater is USAmee #9MM. Your first encounter with USAmee may be deceiving: She has an adorable smirk and a sort of twinkle in her eye. The daughter of an Army man, she’s extremely patriotic and her daddy is her hero. She’s a stay-at-home mama to two wonderful little guys who inherited all of her precious charm. Isn’t she just as sweet as pie? WRONG. Well, kind of. She is sweet, but not too sweet to terrorize you on the track. Facing her, you may catch one of those smirks just before you’re swept off your skates, right into the suicide seats, with one quick, outside booty swipe. Our RED, WHITE, and BLUE blocker is persistent, hard-working, and focused. 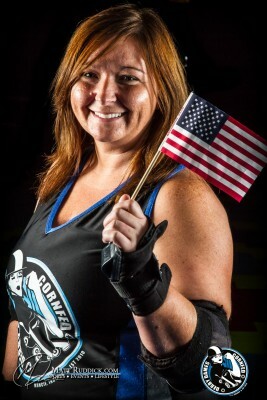 If you want to pump yourself up on bout day like Amee, try “The Angry American” (Toby Keith) and “You Shook Me All Night Long” (AC DC). 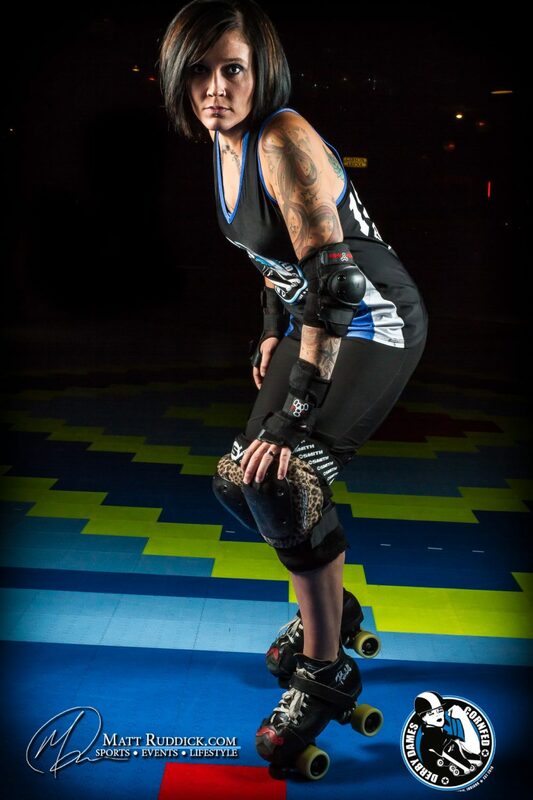 Catch USAmee and the rest of the Dames at CFDD’s next home bout of Season 5 on Sunday, March 29th! Tickets will be available through Brown Paper Tickets, your favorite Dame, or at the door. Keep an eye out for more information! 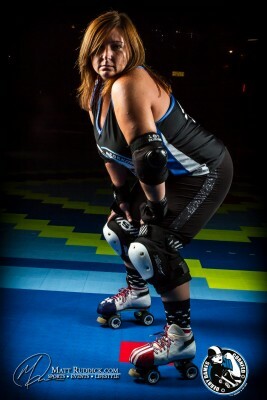 This week’s Featured Skater is Bruisey Ricardo #51. Small but quick and mighty, this little pistol loves donning the pivot stripe. She is a fully-committed blocker, always prepared to take the star. Don’t underestimate her or you’ll likely find yourself hypnotized by the power of her booty. In her spare time, you can find her geeking out on Netflix, out gallivanting with Nuck L. Sammie, or finger painting with her 5-year old. On bout day, she prepares at home with a Subway sammie and 90’s pop dance party: No pants allowed. 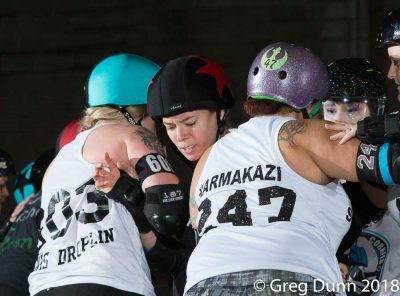 Catch Bruisey Ricardo and the rest of the Dames at CFDD’s first home bout of Season 5 THIS WEEKEND: Sunday, February 22nd! Tickets are available through Brown Paper Tickets, your favorite Dame, or at the door. 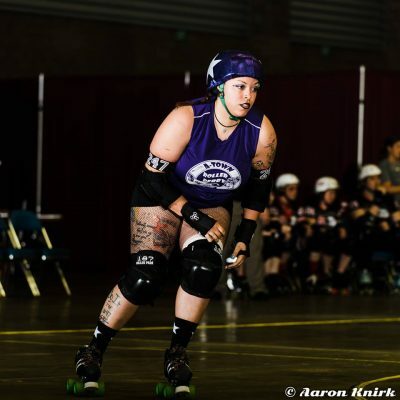 This week’s Featured Skater is B-Flattened #13! B-Flattened, a clarinet player of eight years (see what she did there? ), is one of CFDD’s veteran blockers. 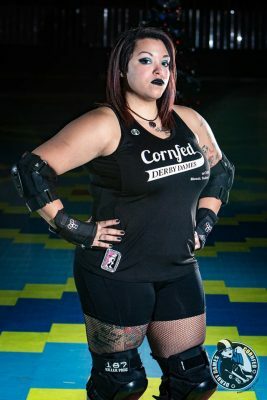 If you ever find yourself an opposing jammer, thinking you’ve made it past her booty to the safety of the top of the pack, think again! Chances are, she’s already waiting for you there and you’re right where she wants you. If you ever find yourself in the Emergency Room, you might just be under the care of Nurse B. Working as an ER nurse is just a bit of her workout routine! She’s no Muncie native, but she’s no stranger to corn on the cob and this is where she calls home. 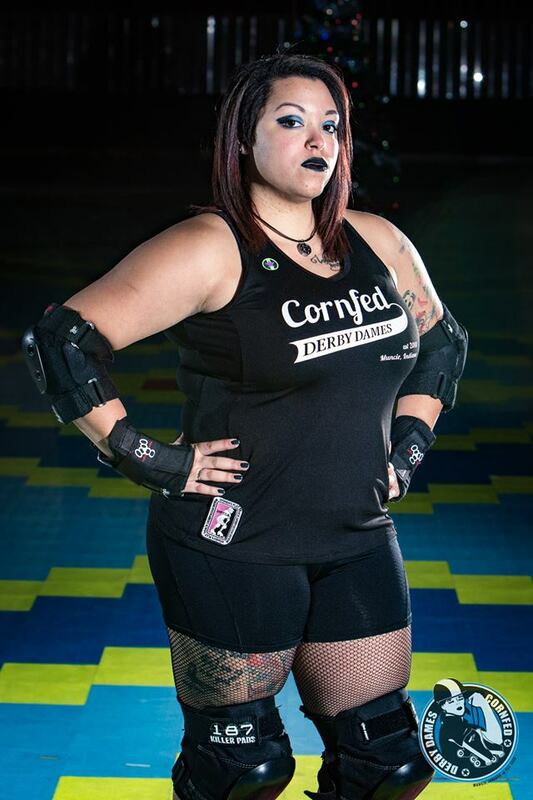 After pumping herself up with her bout day favorites, The Pretty Reckless and In This Moment, catch B-Flattened and the rest of the Dames at CFDD’s first home bout of Season 5 on Sunday, February 22nd! Tickets are available through Brown Paper Tickets, your favorite Dame, or at the door. The first bout of Season 5 is coming in HOT and we want you to get to know a Dame every week! 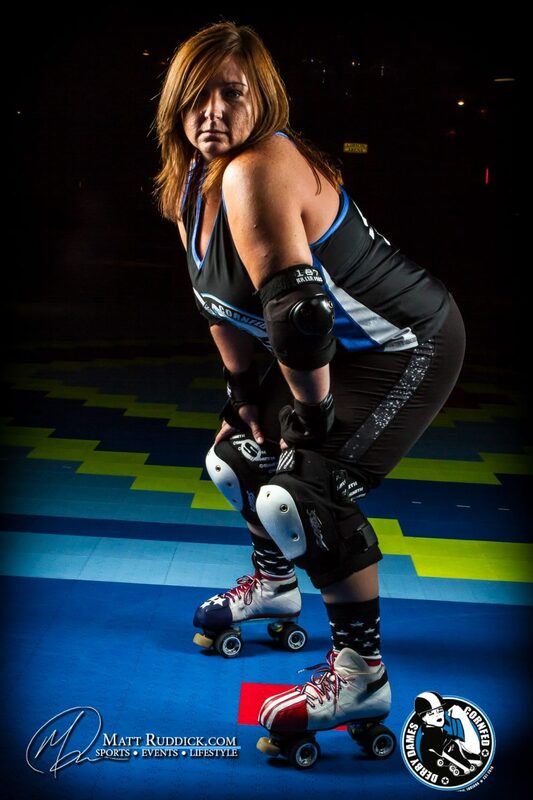 This week’s Featured Skater is Betty Fhite #88 ½. Betty is a multi-talented FORCE: Nurse, theatre-dabbler, karaoke diva, mother of three cats, Betty White superfan, and blocker for CFDD. 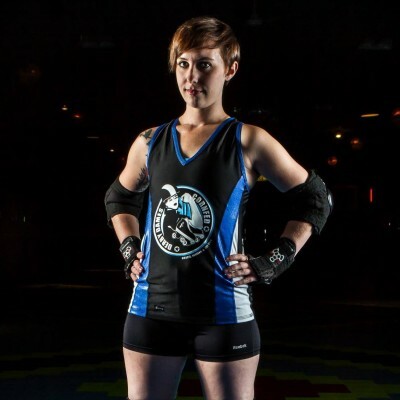 She loves roller derby because it prevents her from living at her job, keeps her active, and gives her a reason to travel and meet new people. “My home away from home is Topsail Island, North Carolina. I love that island and I try to travel to see my beach family three times a year.” On bout day, you might find her blaring Christina Aguilera, Whitney Houston, or Pre-Glitter Mariah Carey while applying her signature blue MAC eye shadow and metallic blue stripe under her right eye. Catch Betty Fhite and the rest of the Dames at CFDD’s first home bout of Season 5 on Sunday, February 22nd! Tickets are available through Brown Paper Tickets, your favorite Dame, or at the door.